An individual’s visual introduction to a GAA club (or other sports team) usually comes via its crest – also referred to as a “badge” or, more commonly with American sports, a logo. The Co-op’s crest features a rampant Cerberus in the club’s primary oxblood color over a silver field. The three heads symbolize the past, present, and future. The charcoal corners currently remain blank as a testament to future possibility and sit atop an oxblood chevron, always punching up. 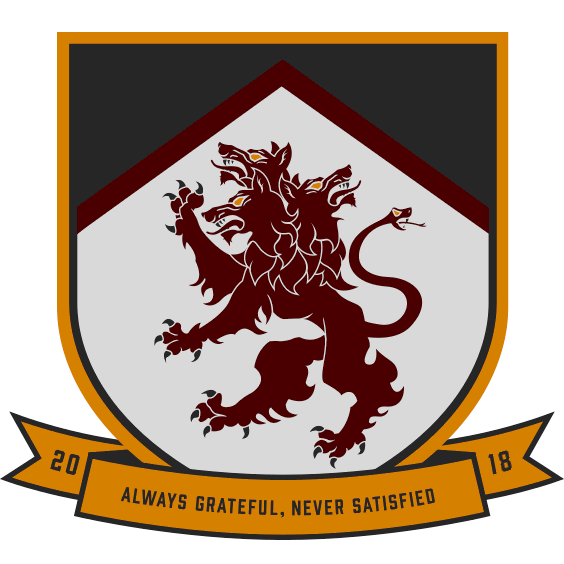 The amber scroll beneath the crest features the Co-op’s motto – “Always Grateful, Never Satisfied” – and the club’s founding date, 2018.